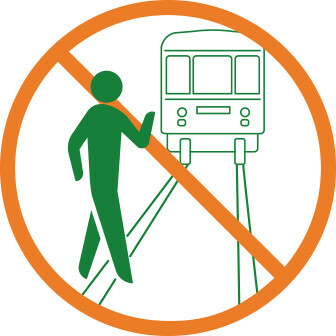 Do not enter the track area due to imminent danger of getting hit by a train. 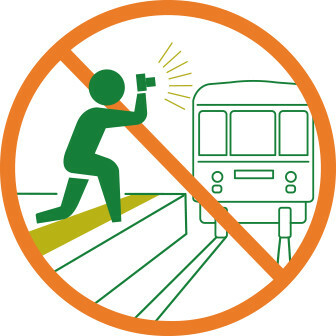 On the platform, do not step beyond the yellow line and do not use flashes or other lighting equipment as this will interfere with safe train operation. Also, try not to inconvenience other station/train users or local residents. 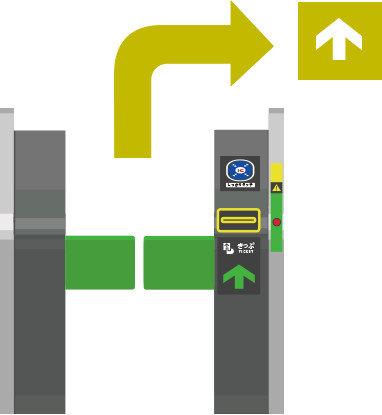 You can check your destination and fare on the fare table above the automatic ticket vending machine. 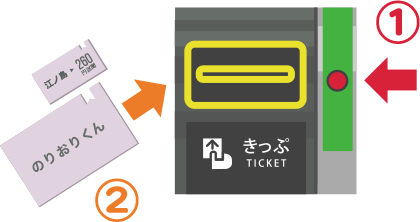 Switching to English display is possible by pressing the button at the bottom left of the screen of the automatic ticket vending machine screen. Touch the fare for your trip after checking it on the fare table. Then insert your money into the automatic ticket vending machine to purchase the ticket. The Enoden 1-day pass ticket “Noriorikun” can also be purchased from the automatic ticket vending machine. To do so, touch the button indicated by the red frame on the left side of the screen. You can also charge your transportation IC cards at the automatic ticket vending machine. 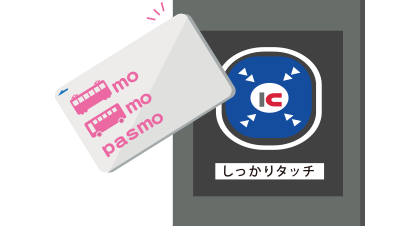 To charge your transportation IC card, touch the PASMO button on the left side of the screen, insert your IC card (PASMO, Suica), then select the desired charge amount and insert your money. For details on PASMO, click here. For details on Suica, please click here. At all stations except Fujisawa, Enoshima, Hase, and Kamakura stations, just swipe your IC card on the touch panel on the simple IC card ticket gate! Be sure to swipe your IC card on the touch panel of the ticket gate each time you get on and off the train. 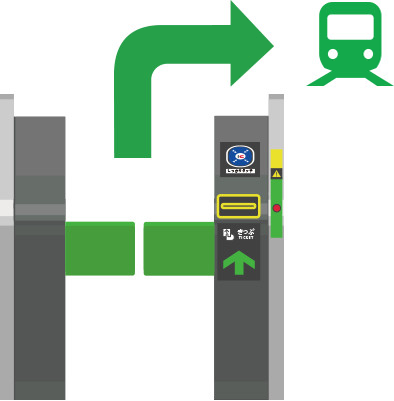 Simple IC card ticket gates are vertical, so be careful not to miss them! 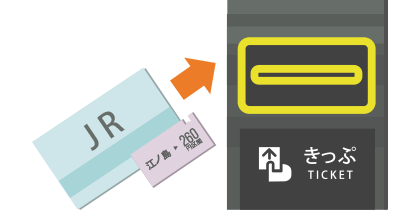 When you get on the train, you must swipe your IC card on the touch panel of the green ticket gate, and when you get off , on the touch panel of the yellow ticket gate. You can use nationwide IC cards.Besides PASMO, you also use Suica, Kitaca, manaca, TOICA, PiTaPa, ICOCA, Hayakaken, nimoca, and SUGOCA. When you get on the train, an error will occur if the remaining balance on your IC card is less than the basic fare. 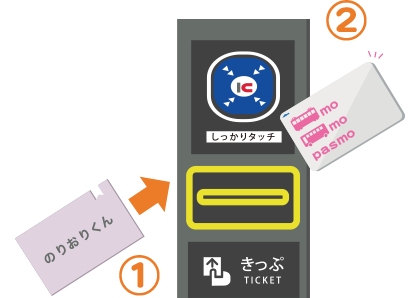 To charge your IC card, use a ticket vending machine. IC cards other than PASMO and Suica can be charged at the manned ticket window. 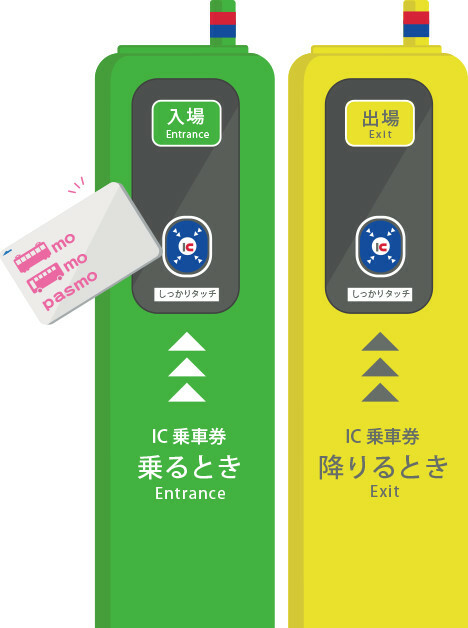 If your IC card causes an error at an unmanned station, please contact a manned station by using the intercom provided on the side of the ticket vending machine. It may take some time. You can transfer from Enoden to JR Yokosuka Line via the transfer gate at Kamakura Station. Please insert both tickets at the same time. If you have a ticket not accepted by the automatic ticket gate, please use the manned ticket gate. Please insert first your ticket (Enoden or JR) and then swipe your IC card on the touch panel. Swipe your IC card you used when you got on the train. You can go through the premise of JR Kamakura Station with your IC card or ticket used to get on Enoden. If you have only an IC card that you did not use to get on the train, you can pass through to the East Gate of Kamakura Station by just swiping it. At the East Gate, swipe your IC card again to exit. To pass through to the East Gate of Kamakura Station through the transfer gate, first press the red button and then insert your ticket.